Be won over by the numerous qualities offered by kitchen islands. They can be incorporated into any style for added convenience and versatility. Stand-alone and functional, an island can blend into a large space perfectly. Located at the heart of the kitchen, it offers several layout options. It can simultaneously be used as a place to cook and eat, a place for storage and preparation, or even somewhere to wash up. Often square in shape, an island can also be rectangular, L-shaped or rounded. They are designed to suit the available space. Nowadays, an island is often naturally incorporated in a space to act as a transition element between the kitchen, dining area and living area. They are also found in separate kitchens, provided the room is at least 15 m2: there needs to be at least 1 m around the entire island to allow you to open the cupboards easily and to move around the kitchen with ease. There are countless solutions available – it’s up to you to find the perfect island for your kitchen. This is the simplest to install. It incorporates open and closed storage spaces that do not require any electrical connections. It is designed for crockery and storing other accessories so that walls are free from traditional cupboards, thereby creating a true feeling of space. 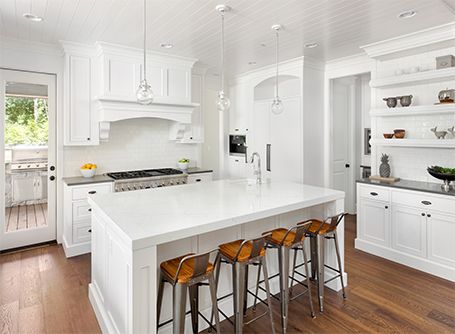 > The preparation (or serving) island – which is the most common – is easy to install. It adds a clever design element to your kitchen, and also offers plenty of storage and additional work surfaces. This island will always require more space than a preparation island. In fact, the work surface around the hob needs to be big enough for the utensils and ingredients you need when cooking. An extractor hood placed above the island becomes an essential decorative element. However, it requires electrical connections that can be concealed in the ceiling. The hob’s supply must also be concealed in the floor. > An extractor cannot be installed above an island with a hob if there is insufficient space. This kind of layout requires a certain amount of space and distance.